This is written for 8mm but is the exact same for 7.7mm only difference is over all length. 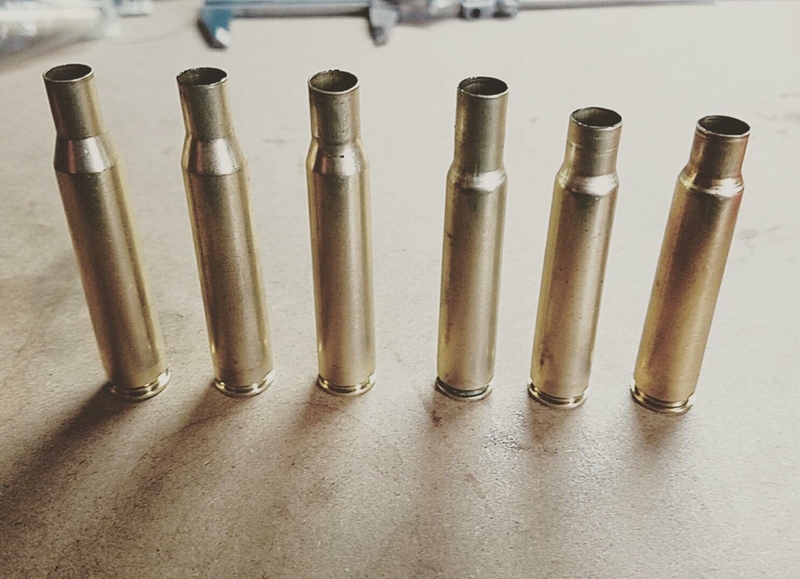 It is easy to make 8mm brass from .30-06 brass. You can use a tubing cutter, saw Dremel tool, ect. How you cut it is up to you. Now you must anneal it. Stand your cases in a cake pan with about 1 inch of water in it. Heat the upper 1/3 of the cases until you get a color change then tip over the cases to quench them. If you have a gas stove in the kitchen this is a snap. If not a propane torch works just fine. Heat the neck and shoulder area of the brass in the fire until the brass just starts getting hot on your fingers. Now drop it in the water. Once dry, lube the case as you would for normal full length resizing. Keep the lube off the shoulder it will dent the shoulder. Run it up into your 8 x 57 die a little at a time. up down ,up down. It will take a few pumps. Once it has run all the way in, trim it to proper length, and run it through the die again. Check the length again and load it up. Mark the brass so it does not get mixed up with others of the same head stamp. I normally use paint in the groove of the rim and a electro pencil on the side of the case. Different color for each different size brass. There you go it, really is less work then it sounds, and 30 06 brass can be found everyplace. Now if it is surplus brass you will have to remove the crimps on the primer pockets before re-priming. This can be done may ways but the easiest way I have found is with a RCBS primer pocket swagger. I used to use a de burring tool until I got the swagger. (about $25-$30) Now that is the cats Posterior! You can fire form it to your chamber if you want. A very light load with a .32 round ball. But I never bother and just load up as normal. The first time the bolt may be stiff but only that first time you use the newly formed brass. I actually just finished doing. This with .270 brass. Just a few extra steps involved. Expand to 7mm and then to .30 cal before continuing the process above. I used a small tubing cutter to trim and it worked fine! Brass turned out great for 7.7. I had to seat the .30 cal expander a little higher in the die then I was taking them up to give it a little more support around the case. Collapsed a couple shoulders at first. +1 on taking it light with the oil around the neck/shoulder to prevent dents. I did wait to anneal until after they were formed to 7.7 which may be right or wrong. The test loads I loaded worked fine and didn't have any cracks. I used a shell holder for a trim die chucked into a drill to rotate the case in the flame to make sure the heat was distributed evenly. Worked like a dream.